It certainly seems like 2016 is just flying by. It won’t be too long before we are evaluating our annual dividend income at the end of the year. 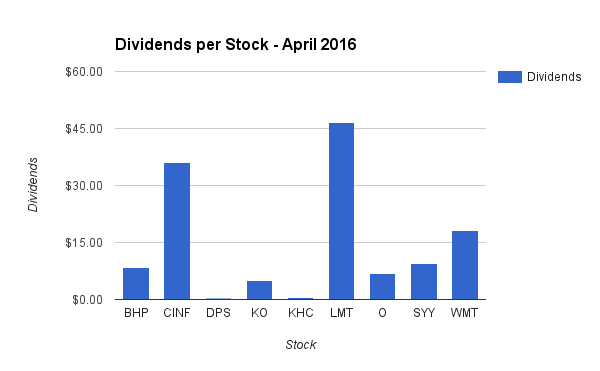 In the meantime, let’s take a look at our dividend income results for the month of April. Without question, this was our most successful April ever for dividend income. We broke the $100 barrier this past month – which was the first time ever for the month of April. It now looks like we should clear at least $100 per month in dividend income for the entire year – unless something catastrophic happens. I love reporting back on past results to see how much we have grown. 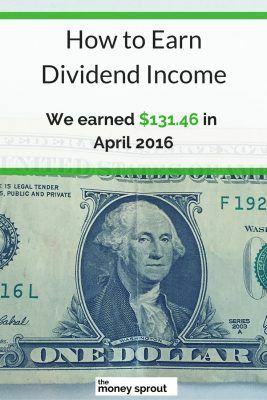 Look at how little dividend income we earned ($14.19) just 4 years ago in April. We saw an increase of over 42% last month compared to April 2015! I discussed it recently here on The Money Sprout about knowing when to sell a dividend stock. Well, my wife and I finally decided to dump two stocks that cut their dividends earlier in the year. We should have taken action as soon as the cuts were announced but waited several weeks. Shares of ConocoPhillips were held in our Fidelity account, so we paid a commission of $7.95 to sell the shares. Our BHP Billiton shares were purchased through our Robinhood trading account – so the good news is that there are no fees! Archer Daniels Midland had been a stock on our radar for some time and we purchased our first shares for the Money Sprout Index. As far as Aflac Inc., we have owned shares in this company for many years and have been adding to our position periodically. I think it is a great dividend income growth stock, so we added to our current position. We are still looking for our next new stock to add using the funds from the COP sale in our Fidelity account. We had our normal automatic investments in WalMart, Verizon, Unilever, Microsoft, Dr Pepper Snapple, Kellogg, Coca-Cola, and Kraft Heinz through LOYAL3 and Computershare. The plan is to really start increasing our new investments starting in May through the end of the year. We have finally caught up on a lot of extra spending from the end of last year and repairs I needed to make on my car. 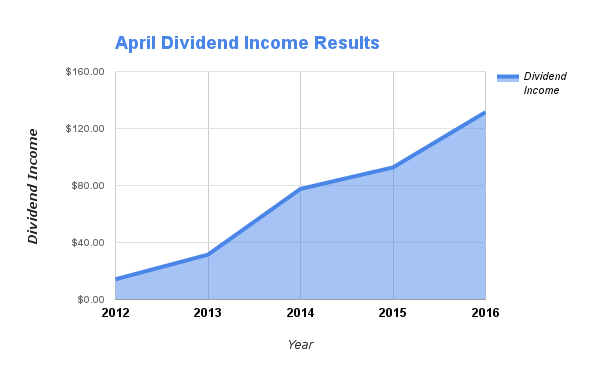 The dividend income earned in April ($131.46) was up over 42% from the same time last year. This is all a direct result of pumping more and more money into the stock market. Based on the quarterly dividend payout cycle, April has never been a great month for income. Just four short years ago we didn’t even earn $15 in dividend income during the month of April. Now look at our earnings – well over $100 for the month and continuing to grow. Starting in May, we really need to pump a bunch more new money into shares of dividend growth stocks. Our 2016 goal is to earn $2,250 in dividend income. At this point, we are on pace to earn a little over $1,670 in dividends for the year. While that is above last years totals ($1,475) – it is well below our goal. Full Disclosure – At the time of this writing, we owned shares in the following stocks noted in this post – ADM, AFL, CINF, DPS, K, KHC, KO, MSFT, LMT, O, SYY, UL, VZ, and WMT. The material above is not a recommendation to buy. Please do your own research on a company before deciding to invest.